Stunning colonial in Berkshire Pointe backing to open common area for better privacy which is rare homesite in the subdivision. Better Than New w/gorgeous stone patio w/transferrable 5 year warranty, custom blinds and Pottery Barn light fixtures. Gourmet kitchen featuring 42" maple cabinets, hardwood floor, modern design knobs and pulls, S/S refrigerator(2017), cook top, hood vent and beautiful glass tile backsplash installed recently. Big island w/granite countertop opens to Greatroom w/fireplace and doorwall leading to new stone patio. Washer and dryer(2017) in convenient second floor laundry room. Big WIC in every bedrooms, lots of storage and loft for entertaining or child's playing. Enjoy community park and sidewalks. Friendly neighbors will welcome you!! School bus stops just across from the street. 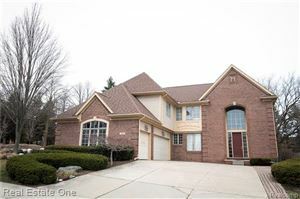 Pristine location close to Novi shopping, restaurants and freeways for stress-free commute. Award winning Novi school including Deerfield elementary. MUST SEE! !